← Infer all the branches!!!!! In the scientific literature, there are now considered to be 16 species of Bembidion subgenus Trepanedoris. What path of research in insect systematics has led us to this point? 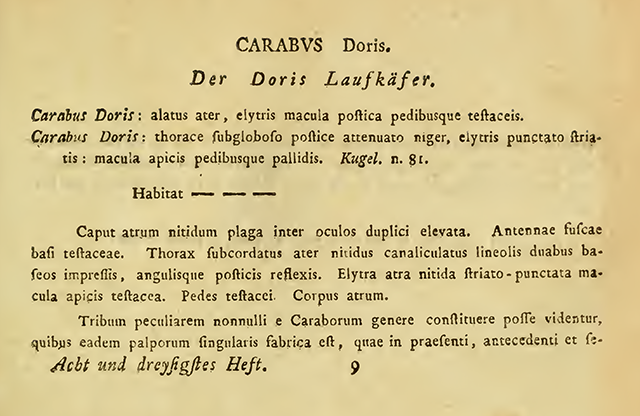 In 1758, when the tenth edition of Carl Linnaeus’s Systema Naturae was published, the scientific community knew about lions, and tigers, and European bears. And the Old World swallowtail, the European stag beetle, Norway maple, and field mushroom, and quite a variety of other species. In total about 12,000 species were described at that point, having been formally given what are now viewed as valid scientific names by Carl Linnaeus (and Carl Alexander Clerck). Between then and 1795, many more species were discovered and described, but among the species known as of 1795, none of them were what we now call beetles of the subgenus Bembidion (Trepanedoris). Of course, those beetles existed in nature – they were living their lives around the Northern Hemisphere, year after year. But although the species were there, they had not yet been discovered by scientists – they were “undescribed”. 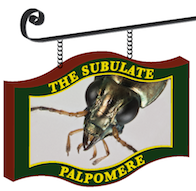 There is an accompanying image that very clearly shows the subulate palp (a characteristics of bembidiines as a whole) and the spotted elytra of what we now call Bembidion doris. The beetles we now know as Trepanedoris were on the biodiversity map! For the following 48 years, no additional species of subgenus Trepanedoris were discovered and described. 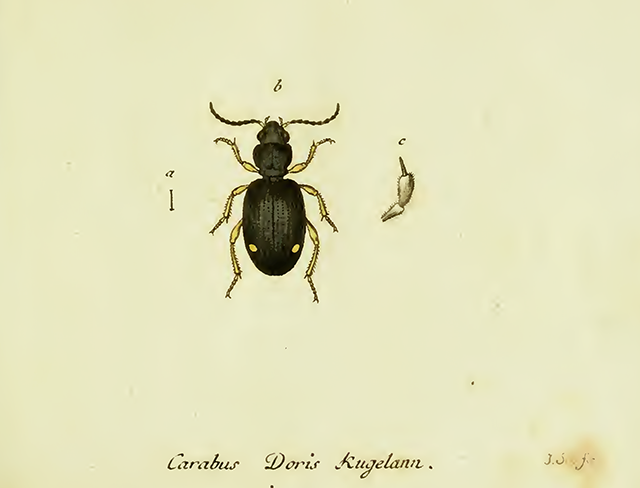 During that time, Bembidion doris was “rediscovered” by several biologists, and redescribed under different names, but no truly novel discovery was made until 1844. This description is a mixture of Latin and French, and it uses some older conventions. 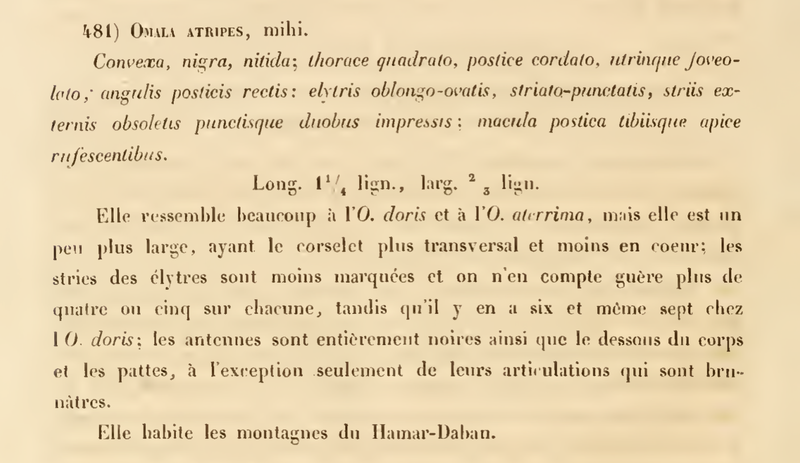 For example, after the name “Omala atripes” he writes “mihi”, which means “me”, indicating that he is the one who is describing the species. These days one would typically say something like “Omala atripes Motschulsky, new species”, or “Omala atripes Motschulsky, sp. nov.”. He also uses an old unit of measurement, a “ligne”, to measure the length of the beetle. A ligne is equivalent to 2.2588 mm. A second species of Trepanedoris was known to science! The next phase of discovery in Trepanedoris was entirely in North America. In 1845 Motschulsky described what is now known as Bembidion fortestriatum from western North America, and John Lawrence LeConte described three species in 1848 and 1852 (now known as Bembidion anguliferum, B. connivens, and B. frontale), followed by Bembidion acutifrons in 1879. With seven species known, there was then a lull in activity until the next century. 1918 was a banner year for this group; two notable events occurred. Thomas Lincoln Casey published a paper in which he described 15 apparently new species of Trepanedoris, all from North America. Casey is notorious for not really understanding species boundaries, and for describing the same species multiple times. As it turns out, it is now viewed that Casey only really discovered five new species (B. ampliceps, B. clemens, B. concretum, B. scenicum, and B. siticum), and that the other 10 descriptions of apparently new species were just redescriptions of already described species. This name is a combination of two other names, “Trepanes” and “doris“. He used this combination because members of this new subgenus were similar to members of the subgenus Trepanes (such as Bembidion (Trepanes) articulatum), and because included within the new subgenus was Bembidion doris. This clade finally had a name! Since Casey’s 1918 work, only four species have been discovered: Bembidion canadianum (by Casey in 1924), B. elizabethae (by Hatch in 1950), B. pseudocautum (by Lindroth in 1963), and B. foraticolle (a Greek species, by Jeanne in 1995). There are thus now 13 known species in North America, and 3 species in the Old World. I should note that this chart is very much a view from the present backwards, and does not track the view that researchers at those time points might have had. So, for example, if we asked Casey in 1918 how many species of Trepanedoris there were, he would have answered 23 (presuming he knew about the Old World species), not 12 as suggested by the chart above. He would have thought there were 23 known, but in fact there were only 12 known, as many of the groups he thought were separate species were not, instead only representing individual variation within species. We thus now know 16 species of Trepanedoris. Let’s see if we discover any more during the next few months, in our Z499 class! This entry was posted in Public Engagement & Citizen Science, Revising Bembidiina, Taxonomic Process, Uncategorized, Z499 (Discovering Insect Species) and tagged Bembidion, taxonomic history, Trepanedoris. Bookmark the permalink.